However, Jessica Swale's adaptation is far from a procession of nifty tunes, this is a bold, clever and still very relevant production for 2017 of the now 123-year-old novel. 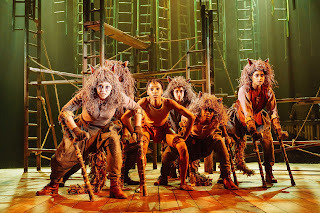 Perhaps strong enough to live without those tunes if needed, this is no musical adaptation. 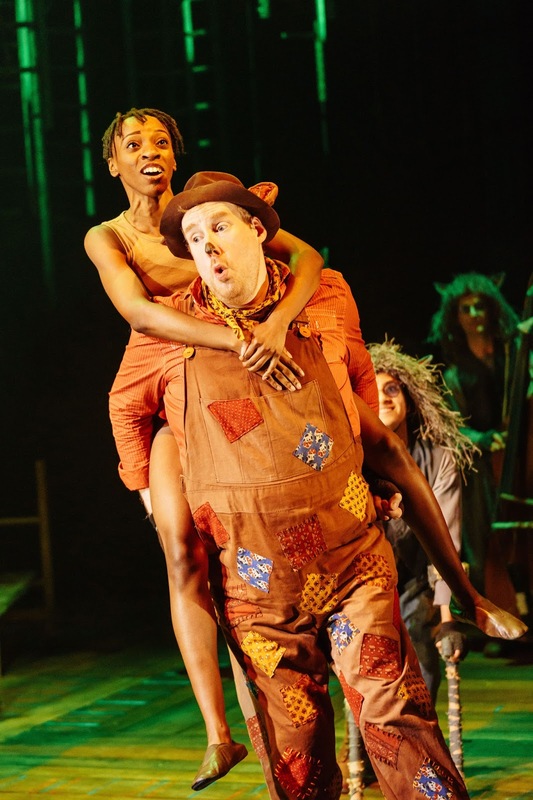 Sweeping clever snatches of humour into sequences you might never have thought of, including a very new meaning to Baloo heading off to the watering hole, and his honey eating to save the bees. Other references hint at two daddies, and later on there is almost a female uprising in the audience, making this definitely one the modern man and woman-man can appreciate. 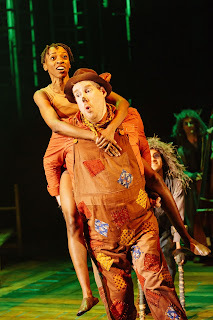 Swale's adaptation also takes more than a little from the panto world, with added interaction and playing to the audience, however, this is no pantomime. This is clever storytelling with just a few nods towards what an audience might expect at Christmas time. Director Max Webster once again spins his immense talent for the bright, bold and fun that he did before with the stunning The Lorax (still happily in my top ten of shows I have seen), and you can see the only constraint on this occasion is the smaller budget and more compact space. None of the creativity is missing, as he mixes puppets with glorious costumes once again. 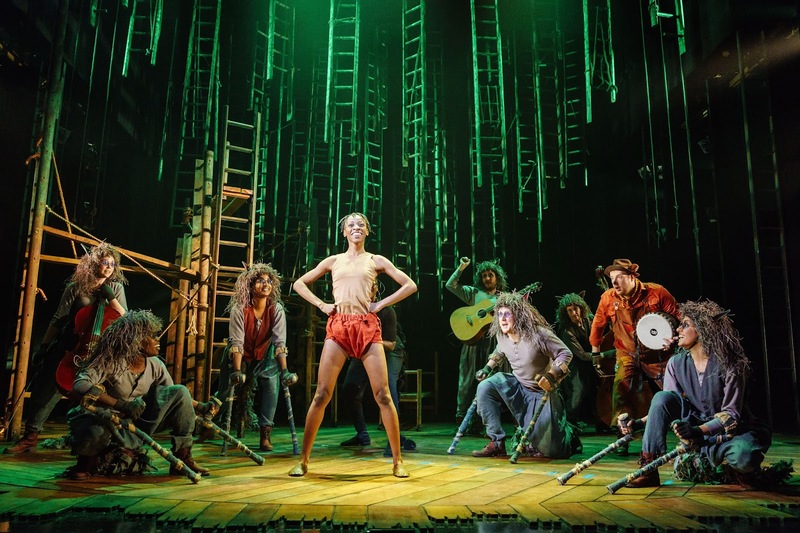 Our infant Mowgli adopting much of the puppetry moments that brilliantly brought The Lorax to life before, bringing Mowgli from infant to boy. At the centre of the story is, of course, this boy, Mowgli, the man-cub in the wolfs den. Here for this production, gender-switched but brilliantly portrayed by a perfectly cast Keziah Joseph. 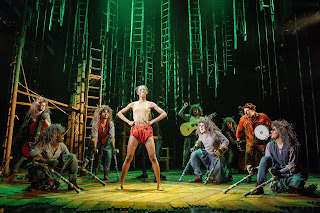 She provides strong vocals to the song routines but much more importantly has the look and poise of who we all feel Mowgli should be. She brings that gloriously lithe sense of movement, nicely bridging the path between human and wannabee wolf. 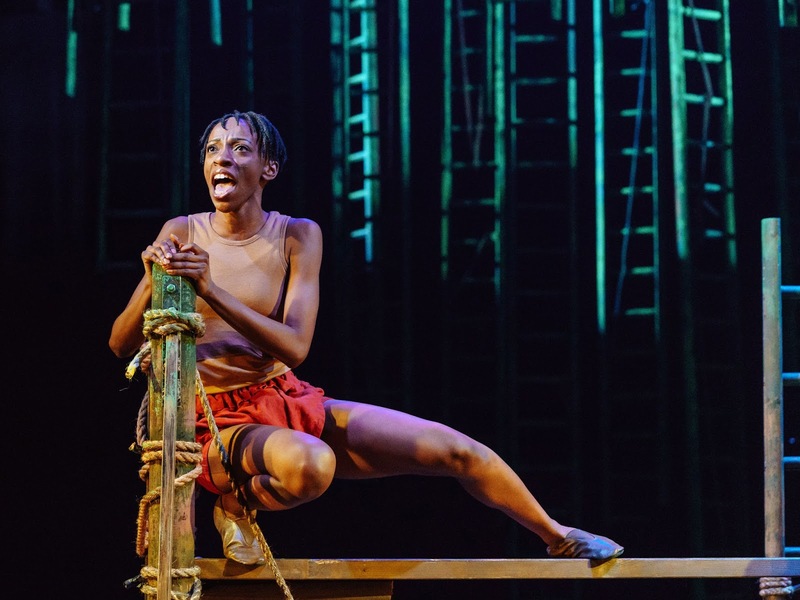 Elsewhere we have a brilliant menagerie of characters, with the stunning swagger of Deborah Oyelade's Bagheera, playing the role cooly and with, as another character mention, a great bit of Patois. It's a brilliant recreation of the classic character (the first of the main ones we are introduced to) and sets the form for all to come. Later we are introduced to the leather-jacketed Lloyd Gorman as Shere Khan, teetering on the edge of panto villain, but just reigning it back in time. He is brilliantly funny as a villain, and some sparkling audience moments, that at the very least have the feel of ad-libs. Kaa, the character I remember most from the (we must no longer mention) cartoon film, is given an extremely feminine makeover, with a slinky Rachel Dawson (and a trio of tail manipulators) making Kaa alluring nature much more prominent. However, perhaps the star of the show, and maybe rightfully, goes to Dyfrig Morris as an extremely Welsh, Baloo. He is simply dazzling, capturing everything anyone will remember of the brilliant bear, even if your memory is only with the (we must no longer mention) Disney film. He is a captivating presence from the moment he galavants through the theatre at the start. He is jovial, fun, full of character and also opens the second act with a brilliant introduction and song. The rest of the world of the jungle is brought to life by the cast with nicely effective costumes. Crutches return to the stage to make humanity a four-legged creature to bring the wolf pack alive. As for the monkeys, what can I say? This is the moment where the show becomes most panto and fits as quite a diversion from the main story for a while. 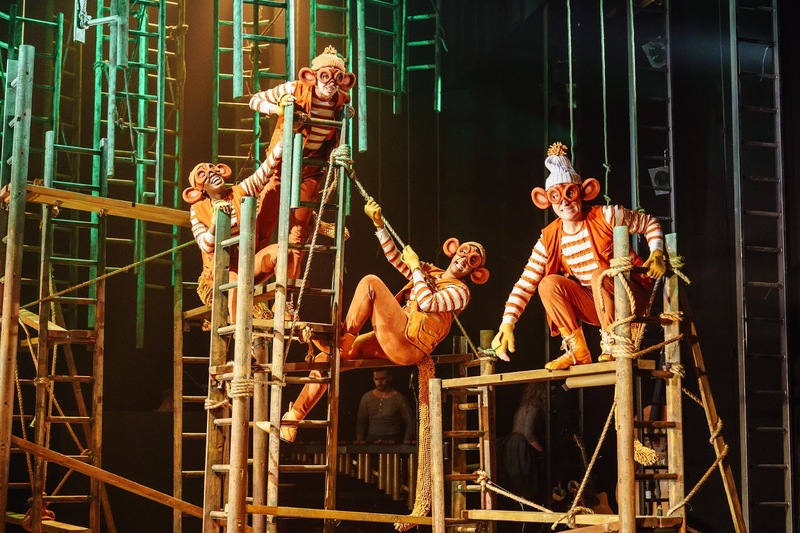 Audience interaction happens (not of the frightening kind, for anyone where this rings alarm bells), inviting us to suggest something for the "performing monkeys" to do, so whether this does vary or not depends, but we got to see them performing a conga on this occasion. Add to this, burps, farts and nose-picking (also interactive, should you so wish), and it's the silly moment of the show, wherein particular T. J. Holmes provides a star turn. 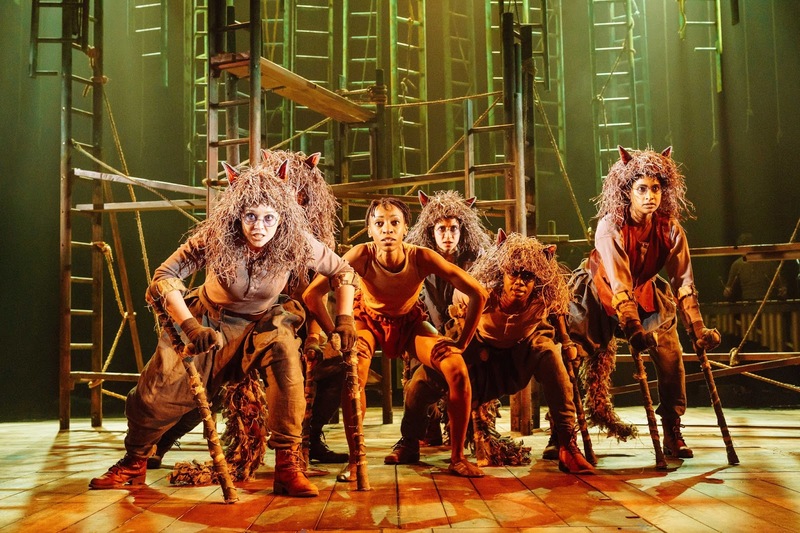 Dance routines are big and bold from choreographer Lizzi Gee, providing the perfect animalistic style vital to the show, and are excellently performed by all of the cast. 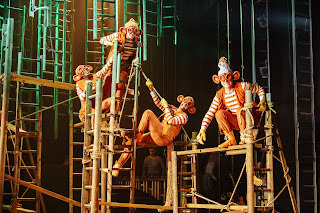 The set from Peter McKintosh is striking, with ladders and ropes falling from the ceiling to suggest the canopy above, while a kind of kiddies playground construction brilliantly acts as the jungle obstacles themselves. Place this upon a revolving stage and you have an excellent, yet challenging set for the cast to traverse. Jessica Swale, Joe Stilgoe and Max Webster have combined to create quite a special show here, adding a modern day edge to the story, and making it a spectacle that, as it should, appeals to all ages. This is the fourth year that I have seen the Christmas show in The Royal, and I have absolutely no hesitation in saying it is the best I have seen. 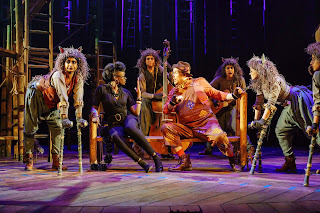 I'll be back to see it again before it departs on its 14 stop tour next year, and I suggest you catch it, either here or out there in the jungle of England. Mr Kipling and his collaborators have made an exceedingly fine, play. Performance reviewed: Friday 1st December 2017 at the Royal & Derngate (Royal), Northampton.